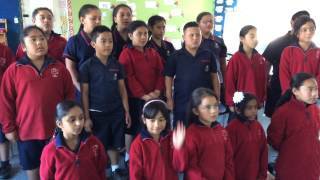 The Saint Therese School Choir is an amazing group to be a part of. We sing together and are practicing for our upcoming performances. The choir runs every Thursday lunchtime in Room 1. Everyone is welcomed to join. 'Slice of heaven' is packed with 100% Kiwi-loved songs and fronted by iconic Kiwi entertainer Jackie Clarke and musician Nathan King. St Therese was a part of this beautiful production. This year, Kids for Kids celebrates 21 years of bringing inspirational mass choirs to New Zealand students, with an estimated 270,000 kiwi kids participating in a Kids for Kids choir. Please click the video at the bottom of the page to watch a little snippet of that amazing night.